Are you smart enough to be a sheep? I have been approached several times with comments like “aren’t sheep stupid?” or “I couldn’t work with sheep. They are too dumb”. My reply is “It depends on what you are raising them for.” If you want them to do cognitive analysis they do not excel at that. However, with their instinctual behavior they have no use for analytics. They work fine in their social organization without control task or strategical analysis. We anthropomorphize intelligence, deciding an intelligent animal is the one most like a human? Our situations are not the same. 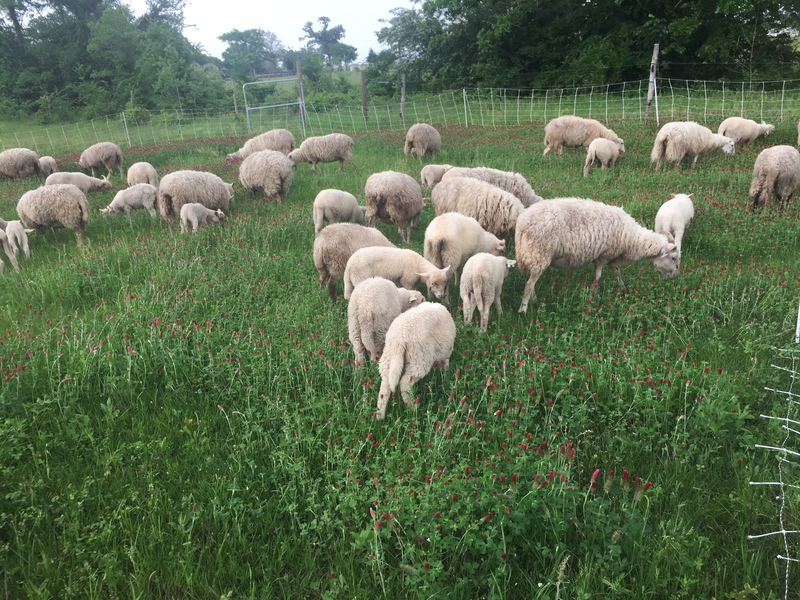 My ewes give birth on pasture and I just show up one morning and there is a new lamb, all cleaned and nursing with the placenta, a predator attractor, nowhere to be seen. Some plants are poisonous at one stage of life and edible at another and the grazing animal instinctually knows this. He does not learn it from watching another sheep keel over after munching on a nightshade plant. The herding instinct, which I have to acknowledge people, especially teenagers, share, helps to protect the individual. However, when adversity happens, like a predator’s smell, they pull together, and do not turn on one another. Individualism is not a smart thing for a sheep. So when I have a sheep that has figured she can jump the fencing and go away from the herd, like Lefty used to do, and eat fresher grass, she becomes vulnerable and I say “Get back in there you stupid ewe”. They are smart enough to know that when it is 100˚ you should sleep in the shade, grazing in the morning and evening. As Noel Coward penned, “Only mad dogs and Englishmen stay out in the midday sun”. However, I see road crews on asphalt, landscapers mowing, and roofers working on the sunny side of the roof, not to mention the joggers on Memorial Park trails in the hottest part of the day, and they are not Englishmen nor mad dogs. Sheep are smart enough to adjust their “work” schedule. Gulf coast native sheep have evolved over centuries and are able to thrive in their environment, both socially and ecologically . Meanwhile, my sheep are not planting a garden, digging a trench, or listening to presidential candidates. They just breed and eat.